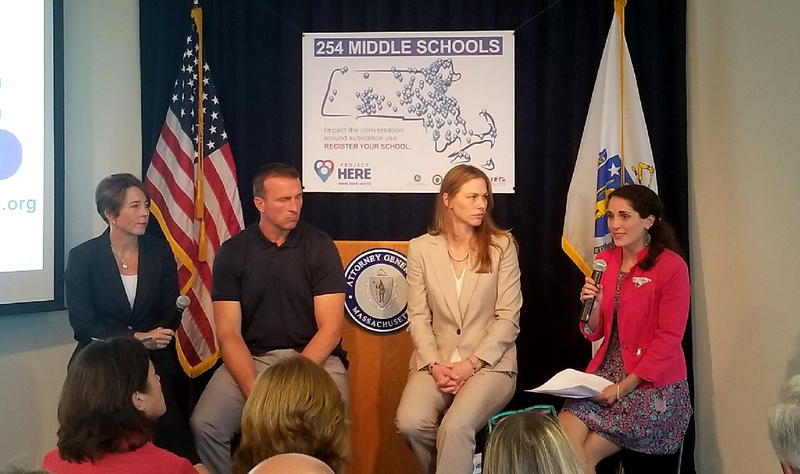 Project Here, funded by the GE Foundation and the Massachusetts Office of the Attorney General, promotes social-emotional learning and empowers middle school students to make healthy decisions. HRIA serves as a fiscal sponsor and program manager to Project Here. On September 17, 2018, Project Here staff and partners participated in press conference at the Massachusetts Office of the Attorney General to unveil Project Here’s newest resources: the online toolkit and Project Here Games. HRiA staff member Carly Caminiti represented HRiA at the press conference. The online toolkit is a compilation of flexible, evidence-based substance use prevention tools that include immediate access to 50+ lesson plans, worksheets, and PowerPoint presentations on topics ranging from stress management to marijuana education to how to respond to real-life scenarios. The new website-based app, Project Here Games, is a tool that students can access in and outside of the classroom. This novel app uses 30 mini-games, quizzes, and scenarios to help students develop skills such as coping and decision-making.